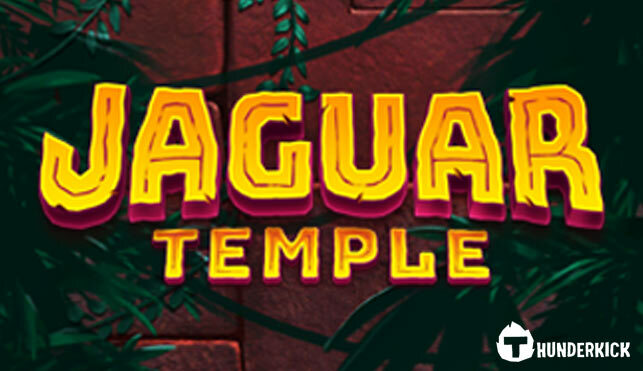 Jaguar Temple is the latest slot game release by Thunderkick. The game was only available at Casumo, which is always the first to add new Thunderkick games, but has now been released to all other casinos offering Thunderkick slot games. Jaguar Temple uses 20 lines and comes with wild and bonus symbols on all reels. The highest paying symbol, a golden jaguar, appears stacked on all reels and also pays any ways, as long as it’s on an active payline. So it will pay from left to right and right to left, even if it appears on reels 2, 3 and 4 only. It can also appear as a 3×3 symbol on reels 2, 3 and 4. Getting 3, 4 or 5 bonus symbols will award 10, 15 or 20 free spins respectively. During free spins the 3×3 jaguar symbol appears more often and all wild symbols will now become expanding wild symbols. 2, 3, 4 or 5 bonus symbols during free spins will award 3, 10, 15 or 20 more free spins respectively. Jaguar Temple is a classic Thunderkick slot games. Big, clear symbols, another unique feature and the chance to win big. A full screen of golden jaguar symbols will pay 1000 times bet. And these golden jaguars appear much more often during the free spins feature. Play Jaguar Temple now at Videoslots, one of the biggest and most popular online casinos today. With a good sign up bonus and weekly promotions and bonuses for all players.